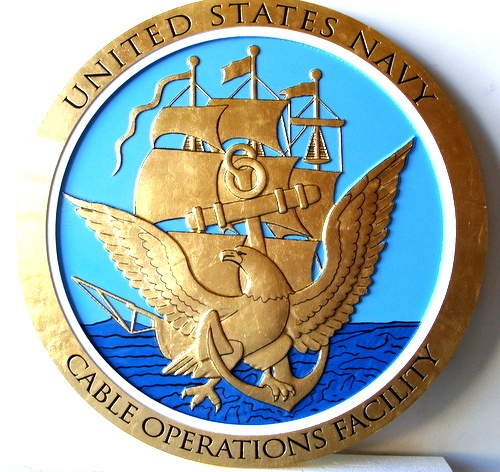 Shown above is a 24K gold-leaf gilded 3D carved High-Density-Urethane (HDU) plaque of the seal of the US Navy . This seal is 24 inches in diameter, The gold color is all 24K gold leaf; other colors are painted with Matthews polyurethane acrylic paint and clear-coated. Above is a photo of a 24K gold-leaf gilded 3D carved High-Density-Urethane Drexel University sdeal . This seal is 72 inches in diameter, and made in 3 pieces with a custom case for easy storage. It is used in Drexel's graduation ceremonies. It is finished with gold metallic paint (darker gold in background areas) and 24K gold--leaf gilding (lighter gold on text , borders, book, and left torch flame) . The entire plaque is clear-coated twice.